This post is originally from late August 2011. I don't think this monster made it into Weird Adventures or into one of my games, but conceptually it's one of my favorite Fiend Folio re-imaginings. If you should find yourself in the City on a lonely railway platform in the wee hours or taking a night train across the dark countryside, you may happen to get the sensation you’re being watched. That may mean you have reason to be afraid. 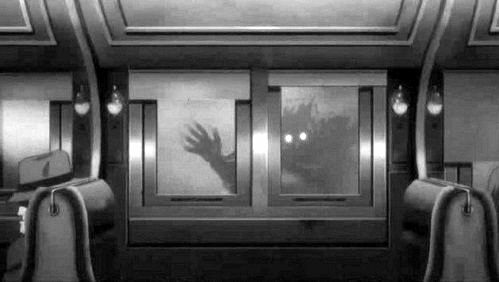 Travelers in similar situations have looked to see the vague shape of what might be a fellow traveler clinging to the shadows of the platform, or have seen a gaunt figure receding in the distance as the train passes, its eyes glowing like signal lights. The rail stalker appears to select his prey at random, but once he has done so he always lets the hapless traveler glimpse him at least once. The next time the victim sees the creature’s pale, naked, and emaciated form may be when he strikes. 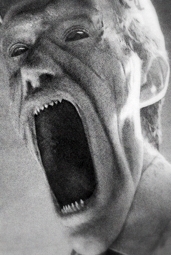 The creature (it is unclear if there is more than one) attacks by opening his mouth absurdly wide in a caricature of a scream and emitting a sound or vibration. Things directly in its path may be damage as if thousands of years of erosion took place in a single moment, concentrated in a narrow area. Those nearby but not directly in the path describe a sudden wave of fear and a mind numbing hum. The stalker prefers to kill by embracing his victim and deilvering a kiss—a kiss that sends his deadly vibration through the victim’s body, turning bone to powder and liquifying organs. Some thaumaturgists believe the sound made by the rail stalker is a sound from the end of the material universe, the wail of of inevitable armageddon that the rail stalker somehow carries in his withered frame. And aches to share with others.